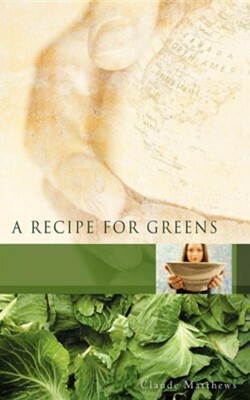 A Recipe for Greens by C.L. Matthews, Jr. provides the reader the opportunity to take a candid look into your life now with a step-by-step guide to setting your inner self-free to realize itself to the highest potential. The surrounding story is mixed with down home reminiscing, humor, reflection and discussion. This readable, inspirational message is intertwined in a very potent recipe for collard greens. Also nestled in the story are thought-provoking mini lessons filled with tips for making choices and decisions best suited for your life. For those of you who have perfected the art of cooking your own Collard Greens, this book will take you on a warm journey down memory lane where you get to review anew how you arrived at the fullness of what you are today. The author, a 26-year champion for social, economic, and civil liberties and equalities for all mankind, has written his thoughts and insights on how each person can assist himself/herself with achieving his/her goals in life. He holds a bachelor's and master's degree from well-respected institutions of higher learning. C.L. Matthews is the founder and CEO of Rescue of Love Ministries, Inc., a 501c3 organization which has served several communities across the country for the last 15 years. His purpose for writing this book is two-fold. First, 30 percent of the proceeds will be used to fund the signature programs of ROL, (Senior Connection and Stop the Pain Clinic). Secondly, he would like for this book to offer enlightenment, enrichment, and to empower those that explore its pages. He believes this book will be a medium for change, a positive change in many lives. I'm the author/artist and I want to review A Recipe for Greens.